For India, space is not the final frontier to be conquered. The country’s performance in solving mundane problems such as poverty, illiteracy and malnutrition may be dismal, but its space programme is soaring high. Its latest achievement: the May 5, 2005, launch of Cartosat-1, a satellite for mapmaking, with a 2.5 metre resolution. The 1,560 kilogramme (kg) Cartosat is the only satellite in the world with two panchromatic cameras positioned so as to measure even the elevation of the terrain mapped, allowing almost instant generation of 3-dimensional maps. The satellite can map the entire country in just 180 days, providing images clear enough for individual buildings to be identified. Cartosat is India’s 35th satellite; the first was Aryabhatta, launched in 1975. A satellite has an average life span of 7-12 years depending on its functions. At present, 15 Indian satellites are in orbit, of which as many as 10 have been launched in the last five years. Simultaneously, India has perfected satellite launch technology — it can now inject a satellite weighing up to 2,000 kg into any orbit. This capability has been used to launch satellites even for other countries such as Germany, Belgium and South Korea. Satellite communication is crucial in this era of digital convergence, which is why the governments in 28 countries invested as much as us$46.3 billion (nearly Rs 2,00,000 crore) in space in 2004, says a report, World Prospects for Government Space Markets 2005, by Euroconsult, a private firm. With a share of Rs 2,540 crore, India was the seventh biggest investor. In the 2005-2006 Union budget, the allocation for space is 24 per cent more, taking the total figure to Rs 3,148 crore. India has spent Rs 25,660 crore since 1962 on its space programme, according to official figures. Unlike advanced nations, India spends these funds not just on research, but also on launching satellites for basic telecom and broadcasting services. In the West, private satellite vendors largely provide for such activities . But the Indian Space Research Organisation (ISRO) designs, develops and launches satellites that are used both by state-owned public service providers and private companies. Its mandate also includes launching satellites, such as Edusat and Gramsat, to enable airing programmes targeted at the rural population on subjects such as health, education and agriculture. Cartosat is the latest in the series called the Indian Remote Sensing (IRS) satellites. The other series of satellites is the Indian National Satellites (Insat). These two series account for the bulk of the Indian satellites — 10 in IRS and 14 in Insat. A satellite can either be geo-synchronous or sun-synchronous. The former remains stationary in relation to the earth at an altitude of 36,000 kilometres (km) while the latter is located about 500-1,000 km away and moves as the sun appears to (from earth) every 24 hours. Satellites meant to provide observation data, such as the IRS satellites, are sun-synchronous. Geo-synchronous satellites are mainly used for communications — receiving/transmitting television, telephone and radio signals. The Insat satellites are in this category. With the first of the series launched in 1983, Insat satellites have been singularly responsible for taking television and telephone to almost 90 per cent of the country. Some also carry instruments to gather meteorological data for use in short- and medium-range weather forecasting, such as to track cyclones. All geo-synchronous satellites function through devices called transponders, which both receive and send messages in the form of electromagnetic signals. Each transponder tracks signals within a specified frequency range and has a typical capacity of 36 megahertz, which is enough to support as many as 12 digital television channels. At present, India has a total of 143 transponders on its satellites in orbit. Earlier, the transponders worked mainly within two ranges of frequencies referred to as the s band and the c band. But as the need for point-to-point communications grew, the higher frequency bands such as the k u band (see Glossary) became popular. An increasing number of transponders nowadays are in the k u band, which is the most suitable for direct-to-home (DTH) telecasts and also for the fast-growing closed user group services such as the Very Small Aperture Terminals (V-SATS). isro transponders were used solely by the department of telecommunications (dot) and the Union ministry of information and broadcasting (i & b), till the Union government adopted a new Satcom Policy in 2000, allowing the private sector access to Insat satellites. Today, 44 of the 143 transponders available with isro are leased out to the private sector — for tv, telecommunications and v-sats. As many as 13 transponders are with private tv channels, which are demanding more. “We have a heavy demand for dth from Star tv, Sun tv and many other tv channels,” says isro chief G Madhavan Nair. “The 143 transponders that we have just make both ends meet. If I don’t put three space craft (satellites) on schedule next, everything will come to a halt,” he adds. Anticipating the growing demand, the 10th Five Year Plan has set a target of 235 transponders by 2006-2007. In the field of telecommunications, the public sector Videsh Sanchar Nigam Limited continues to be a major satellite user. The opening up of national long-distance and international long-distance telecommunications to the private sector since the late 1990s also increased satellite usage. Thanks to technology and policy changes, and falling bandwidth prices, the v-sat segment is poised for a boom. Capable of providing highly-reliable point-to-point communications, even from remote places, v-sat is especially popular among business groups. India has about 45,000 v-sat users, up five times since 2001, according to a recent report of the v-sat Operators Association of India. As the demand for transponders grew, isro effected a paradigm shift in its strategy — from multi-purpose satellites (a single satellite carrying payloads for communication, broadcasting and meteorological applications) to ones dedicated to a specific area such as Insat-3 b for communications and Insat-3 d (later renamed Kalpana-1) for meteorological applications. The design for a multi-purpose satellite allows only one solar array, which limits the total power availability. Dedicated telecom satellites, with transponders on high-frequency band such as the k u band, however, require greater on-board power — either another solar array or high-power devices such as the travelling wave tube amplifiers, which require large heat dissipation systems. With either option, the result is an increase in the overall satellite mass. It is predicted by 2005, nearly 50 per cent of the satellites launched will weigh more than 4,000 kg. “Specific applications have increased manifold. Earlier, expectations from Insat-1 a were not high — it had just meteorological and telecommunication instruments, but now we need exclusive communication satellites. The transponder demand for day-to-day communication process is increasing rapidly,” says Nair. Insat-1 a, the first in the series, weighed a mere 1,200 kg. But Insat–4 a (scheduled for launch later this year) will have 24 transponders (12 each in c band and k u band) and weigh about 3,100 kg. “We used to have a hand-to-mouth existence but since the last one year there has been a turn around with the launch of Insat-3 e,” says Sridhara Murthy, executive director, Antrix Corporation, the commercial arm of isro. The growing demand for space services is reflected in Antrix’s rising annual revenue, which increased from Rs 40 crore to Rs 370 crore over the last five years. Even though isro’s capacity to build and launch satellites has improved over the years, there have been major slip-ups in the utilisation of these precious, nonrenewable resources. On the other hand, isro officials say India is heading for a transponder shortage. Can India afford underutilisation of a resource whose shortage is imminent? Launched in September 2004, Edusat is perhaps the world's only satellite fully dedicated to distance education. Edusat moves in a geo-synchronous orbit. Its 12 transponders (six in k u band and six in extended c band) provide five spot beams (see Glossary), each covering a specific region, and seven national beams covering the whole country. Edusat is meant to transmit education programmes for students of primary, secondary and higher level institutions even in far-flung areas through 1,25,000 to 1,50,000 terminals. The content for the project is to be created by 20 nodal agencies such as the Indira Gandhi National Open University (ignou), the All India Council of Technical Education (aicte), national institutes/universities and state education departments. The project has been bandied about as a vehicle to universalise education. But even after almost a year of its existence, it is severely underexploited, according to an official estimate. Barely 35 per cent of the national beam and around 30 per cent of regional beams are being utilised, s ays B S Bhatia, director of the Ahmedabad-based Development and Educational Communication Unit (decu). He hopes capacity utilisation will jump to 50 per cent in four to five months. But even that appears unlikely. According to a source associated with an educational institution developing programmes for Edusat, only two universities -- the Anna University in Chennai and the Goa University in Goa -- are providing daily uplinks on the national beams. While Anna University airs programmes for five to six hours every day, Goa University broadcasts just for one hour a day. But Edusat can actually support dozens of digital channels! Considering that Edusat has a life span of seven years, it is sad there are so few programmes available, said a source on condition of anonymity. And that too, after the government invested at least Rs 330 crore in the project. While the plan for launching an exclusive educational satellite was taken at least seven years ago, why wasn't content generation also rigorously planned, he wondered. The first meeting of agencies involved in producing content for Edusat was organised only two months before the launch. India's involvement with satellite-based distance education dates back to 1975, when it launched a Satellite Instructional Teaching Experiment (site) programme using a us satellite. decu, set up as part of the site programme, continues to carry out similar experiments in developmental communications. Before launching Edusat, a pilot project was started using Insat-3 b at three universities -- the Visvesvaraya Technological University (vtu), Belgaum, in Karnataka, the Yashwantrao Maharashtra Open University, Nasik, in Maharashtra and the Rajiv Gandhi Technological University, in Bhopal, Madhya Pradesh. But the experience gained does not show up in the way the Edusat project is being implemented. Sources at ignou and aicte say their broadcasts will not be ready at least for a few more months. Even if they deliver as they promise, how much of the shortfall can be made up? Another area of concern is ground facilities, or receiving terminals. For instance, out of 123 terminals that ignou plans to establish, about 85 have been set up so far, says Rakesh Sharma, engineer-in-charge, ignou. The ignou network will be ready by July-August this year, he adds. Similarly, aicte was to set up 100 receiving stations, but the process has just begun. So is the case with most other content providers such as the Indian Institutes of Management (iim). However, some academics are upbeat about Edusat . vtu vice-chancellor K Balveera Reddy says, "Edusat will be very beneficial considering the shortage of teachers, especially in frontier areas of technology." S Chandrasekhar of iim Bangalore, says Edusat is an attempt worthy of praise. "The challenges that such satellite-based education programmes offer are tremendous." But he feels such virtual classrooms cannot be a substitute for conventional teaching. At the most they can be complementary. Edusat is the third in a series of satellites called Gramsat, or g sat, intended to improve rural communication and connectivity. The first in the series, g sat-1, was launched in 2001, but failed. g sat-2, launched in 2003, is being used to take forward the Training and Development Communication Channel (tdcc), a one-way video and two-way audio teleconferencing network that isro initiated in 1995.
tdcc broadcasts were started in Jabua, Madhya Pradesh, in 1996 with programmes on health, education, nutrition as well as news in regional language. These telecasts are available to most villages in Jhabua and two neighbouring districts. In July 2004, tdcc transmission started for villages in Orissa following the setting up of a v-sat based network using g sat-2. Subsequently, tdcc was upgraded as Gramsat with the inclusion of several new components such as e-governance, data connectivity, natural resource imaging system and disaster management systems at the village level. "In Orissa, it (tdcc) is now connected to 314 blocks of Orissa, and 885 villages in the Kalahandi-Bolangir-Koraput region. Programmes are run on agriculture and health,'' says Bhatia. Two other states that have similar programmes, albeit in a limited manner, are Gujarat and Karnataka. isro is scheduled to launch an exclusive satellite for telemedicine, g sat-4, in 2006-2007. In 1996 Saraswati Sugars, a reputed sugar mill in Yamunanagar, Haryana, approached the Hyderabad-based National Remote Sensing Agency (nrsa) for satellite imageries. The sugar mill wanted to use remote sensing data to check the sugar content in the cane grown in farms around its premises to decide the best time for harvesting. This was achieved by superimposing nrsa data with maps of the locality procured from the Survey of India. The mill found the maps useful enough to continue procuring four to five maps from nrsa annually, paying Rs 25,000 for each image. The technique has been very effective, according to Kripal Singh, a manager in the mill's cane department. Saraswati Sugars is among a growing group of users of remote sensing data in India. It includes scientists who have used satellite maps to detect a deadly mosquito species Anopheles dirus in forests to makers of city maps. isro claims that the irs programme led to a four-fold increase in the fish catch that occurred after the 1999 launch of Oceansat, a remote sensing satellite dedicated to gathering ocean data. 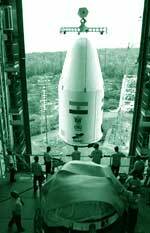 India's efforts in remote sensing took off when isro launched irs-1 a -- the first in the irs series -- using a Russian launch vehicle on May 17, 1988. 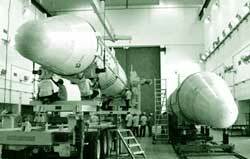 By 1994, India had developed its own satellite launch capability. Currently, India has seven irs satellites in orbit, making its constellation of civil remote sensing satellites the world's biggest. irs data accounts for 15 per cent share of the global remote sensing data, says isro chairperson Madhavan Nair. Its ground stations are spread over more than 20 countries including Australia, Canada and Germany. A us firm, Space Imaging, sells irs data in several countries. The data is popular abroad because it is as good as that provided by satellites launched by Western countries, but cheaper, says Chandrasekhar of iim, Bangalore. But what India needs to do, according to him, is go for a good branding for irs data. Nearly 200 small, largely entrepreneur-driven industries in India are involved in satellite imagery data processing using irs data. Typically, they buy data from nrsa, which is a part of isro, add value to it and sell it to clients worldwide. But within India, remote sensing data remains underutilised among potential end-users. "We are notoriously slow in adopting new technologies," says Chandrasekhar. Another problem is the archaic security regulations that debar ordinary people in India from using such data. While maps of up to 1 metre resolution for several Indian cities can be easily downloaded from external sources, the labyrinth of Indian rules discourage several users from accessing such maps produced within the country. "These people (the authorities) have to grow up and need to look for better ways for ensuring national security rather than blocking the usage of a useful tool," said one scientist. The Indian space programme has done reasonably well despite several minor hiccups. From experiments with the firing of eight-centimetre thick "toy" rockets in 1963 to sending forth a 414-tonne geo-synchronous satellite launch vehicle in 2003, isro has persevered against all odds. Sanctions and technology denials from countries such as the us may have delayed goals, but failed to throw isro off-track. India's changing economic scenario following liberalisation has put additional onus on isro. It now wears several hats: a public-funded research agency, a satellite vendor, a regulator of space services and a satellite and launch vehicle builder. Besides, demands for its transponders now come not only from the public sector, but also from private firms. Such demands at times forced isro to reshuffle its satellite launches. For instance, Insat-3 b (2000) and Insat-3 c (2002) were injected into orbit by European launcher Ariane ahead of Insat-3 a, partly to meet the demand for extended c band transponders for v-sat operations. Experts admit there is a dearth of transponders. However, optimal use by Doordarshan (dd) and the department of telecommunications (dot) may help free up some capacity, they feel. dot uses as many as 37 Insat transponders, mostly in c band, for domestic satellite links and international telecommunication gateways. dd has 20 transponders (which actually came down from 24) for its 27 channels. This is further expected to come down to 16. In comparison, 70 private tv channels are using just 13 transponders. isro and dd officials defend the current pattern of usage. "Our transponders are not underutilised at all," claims dd's chief engineer A S Guin. According to S B Iyer, director, contracts at isro, 30 per cent of dd 's transponder capacity goes to regional news feeds and digital newsgathering. But sources closely watching isro wonder why it hasn't ever carried out a study to assess the requirement of dot and dd instead of just supplying transponders as demanded. "After all it is tax payers' money that is involved," as one of them said. Estimates by the Planning Commission peg the requirement at 235 transponders by 2006-2007. "In the next two years we plan to add 50 transponders," says isro chief Nair. The bulk of this demand will come from the private sector. But considering that isro is a public-funded agency, should it be seriously concerned about the growing demand from the private sector and how it will meet it? In any case, there are several private satellite vendors offering transponders on lease. Under the Satcom policy, if isro cannot meet the demand of a private company, it can lease transponders from global vendors. According to a recent report prepared by us -based market research agency Futron, there is an excess bandwidth of 1,000-10,000 mhz available on foreign satellites for India. The capacity of a typical transponder ranges from 36 to 40 mh z. Perhaps, isro should pay more attention to projects such as Edusat. It is already drawing flak for the way the project is being implemented. While the idea of using space technology to bridge the urban-rural divide in education may be laudable, as things stand now, it is anybody's guess how good the content can be, which in any case is falling far short of the satellite capacity. From ignou to aicte, all content providers say their broadcasts will largely consist of televised lectures. Would such telecasts attract any students? The other ambitious project -- Gramsat, launched in 2003 -- appears to be similarly underutilised. Gramsat pilot projects (gpp) were launched in four states, but only Orissa has put gpp to some use. There too, its function is limited to serve as a communication gateway that links the district and block offices to the state capital, Bhubaneswar, with occasional use by departments such as health, panchayati raj, rural development and watershed development to train their staff in far-flung areas. In a 2004 report, the parliamentary standing committee on science, technology and environment had recommended to the department of space that Gramsat projects cover the entire rural India by 2006-07. But at the current rate of progress, such goals may remain confined to paper. For any country to design, build and launch its own satellites is no mean achievement. isro gets all the credit for it. But when compared with other countries with similar capability, isro's work cannot be described as extraordinary. What can actually tell it apart perhaps would be how it uses high-end space technology to develop strong links with rural India; be it through through Edusat or Gramsat. This, then, will be the final frontier for India.